has very relaxing and cozy place to stay, enjoying each well prepared dish. 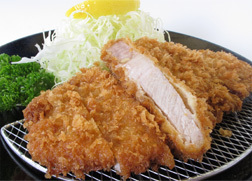 Every Katsu Set is served with Koshihikari Rice, Shredded Cabbage, Miso Soup, Homemade Pickles and Fruits. 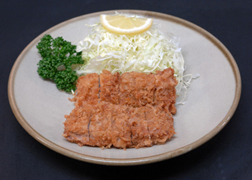 Please feel free to request a refill of Koshihikari Rice, Miso Soup and Shredded Cabbage salad, till 2 times each. Please try Himalayan rock salt and Special black pepper from KYOKO, when you eat first time to enjoy the sweetness of the KUROBUTA Pork Sirloin. 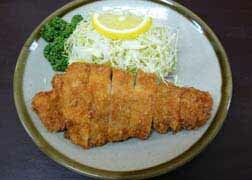 and then, enjoy in your way with Tontei Special katsu Sauce served on the table. YAMATOBUTA Sirloin is really famous for Shabushabu in Japan, receiving Japanese Minister of Agriculture, Forestry and Fisheries prize and German Agriculture Association International Food Exhibition Gold prize. 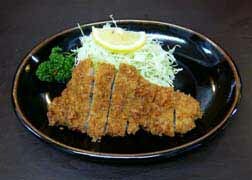 This is one of our most recommended Tonkatsu we serve at our restaurant if you like Sirloin Katsu. This dish is really good for your heath and your skin, especially when you feel tired. Copyright (C) tontei. All Rights Reserved.